Science attempts to explain the world in which we live. It provides technologies that have had a great impact on our society and the environment. At Prenton High School we are proud to have a forward thinking and ambitious Science department. Our teaching encourages students to understand theoretical concepts while developing practical Science skills from Year 7 through to Year 11. We believe that science has something to offer every student. Our curriculum is designed to allow our young scientists of all abilities and all aspirations to explain phenomena and solve problems using evidence. From the very beginning of year 7, all lessons are fully ‘hands-on’ and practically based where possible. We are constantly evaluating the Learning Schemes we teach to ensure all students can become scientifically literate, be equipped to question and engage in debate. Prenton’s Science department has consistently pushed the boundaries for our students to succeed in Science and Engineering. We enter UK RoboCup Championships every year and have been champions eight times, going on to compete on the world stage in the USA, China, Austria, Singapore, Turkey, Mexico, Holland and, in 2017, Japan. Prenton High School led a combined Science and Art initiative with other local secondary schools that gained a place in the finals of the Rolls Royce Science competition. No wonder Prenton High School’s Science Department is recognised as “ground breaking” by the University of Oxford, Imperial College London and Rolls Royce Engineering. We have a very modern set up, with six specially designed laboratories. Each Lab is spacious and fully equipped to teach Science to the highest standards. The department is made up of six teaching staff and two Science technicians. The Science staff are specialist teachers of biology, chemistry and physics. The Science technicians are an invaluable asset to the department, providing support both in the running of the department and in preparing equipment for practical work. Our popular after-school STEM club (Science, Technology, Engineering & Mathematics) – supported by the Royal Academy of Engineers in London – brings fun in to the learning of Science.”Back to School” evenings, for parents, carers and their daughters, attend stimulating hands-on lectures that provide a valuable insight into how adults can support their daughters in their studies. 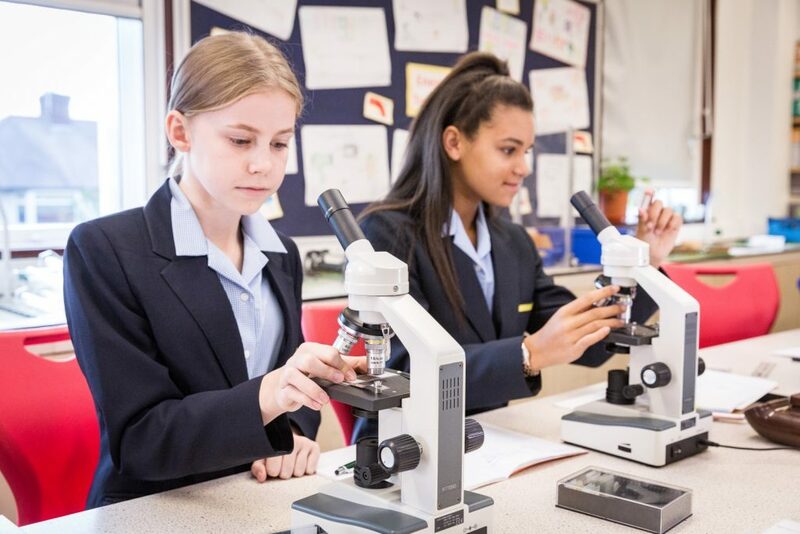 We deliver an exciting and high-quality Science education to students in Year 7 and Year 8 to provide the foundations for understanding the world through the specific disciplines of biology, chemistry and physics. Teachers deliver lessons that include essential aspects of the knowledge, methods, processes and uses of science. All pupils are encouraged to understand how science can be used to explain what is occurring, predict how things will behave, and analyse causes. From the very beginning, we develop our student’s use of scientific vocabulary, including the use of scientific nomenclature and units and mathematical representations. Throughout the course each student’s progress is monitored. Each year has 4 topics from each of the 3 Sciences assessed periodically. In Year 9 all students start their GCSE learning scheme with the new GCSE Science Curriculum. Current students in Year 11 will be the first to take the new – style GCSE Science exam that the Government announced in 2015. These will be first examined in summer 2018. This early start also allows a Triple Science GCSE to be delivered. Although well prepared in Years 7 and 8, work in Year 9 may appear to be more challenging than expected because students are being prepared for the new, more rigorous, GCSEs. Students continue to work through the GCSE course in Years 10 and 11. In the summer exams at the end of Year 11, any students taking the ‘Trilogy’ (worth 2 GCSEs) will be assessed with 6 x 1 hour 15 minutes papers (2 Biology, 2 Chemistry, 2 Physics) in both Foundation and Higher Tier, each worth 16.7 % of the total GCSE. Questions are made up of multiple choice, structured, closed short answer and open response. The most able students will embark on separate GCSEs in Biology, Chemistry and Physics. Completing 6 x 1 hour 45 minute papers (2 Biology, 2 Chemistry, 2 Physics) in both Foundation and Higher Tier. Each paper is worth 50% of each separate GCSE. In addition to this students are assessed on aspects of ‘Working Scientifically’. This is the sum of all the activities that scientists do and it’s important we weave it throughout our teaching and and written papers.